A group of intrepid Four Wheel Drivers recently set out on a mission – to test the new Yokohama Geolandar G015 AT tyres across some of the toughest terrain in Australia. Four good friends in their trusty Nissan Patrols met in Longreach and crossed The Simpson Desert to Uluru and the heart of this beautiful, sunburned land. 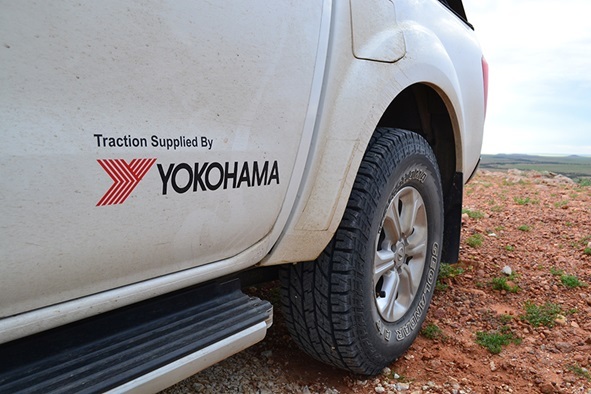 Having never driven on these Yokohama tyres and with wet weather imminent around Birdsville, the question on everyone’s lips was – would the Geolandar G015 ATS tyre treads be up to the job? After a good night’s sleep, the group set off for Birdsville, driving through spectacularly varied scenery which had come alive after the recent rain. Their worries about the weather proved to be unfounded and they arrived in Birdsville without incident. The tyres also made light work of the big sandy dune at Big Red, which was deep and soft towards the top. The real tests still lay before the group, as they began to cross The Simpson Desert. “As you drive through mud, the tyre tread obviously fills up. However, these tyres are designed in such a way that this mud is then flicked out as much as possible. This allows the treads to keep biting into the terrain and gain valuable traction. Sometimes we could only be travelling 5kms an hour, but keeping the wheels spinning kept cleaning them and they grabbed enough surface to keep up momentum”. Continuing through jaw-dropping landscape, the group arrived tired and thirsty at Mt Dare, to recharge before they continued on to Uluru. The Geolandar G015 A/T tyres are Yokohama’s latest All Terrain tyre, which are designed to handle the toughest conditions in quiet and comfort. Find out more from your local Yokohama dealer today.